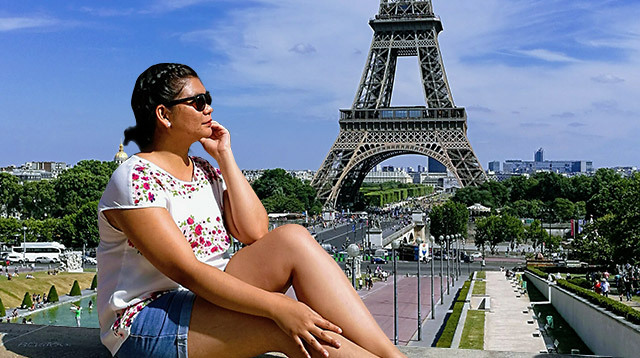 26-year-old Leni Morales is on her way to earning an MA in Europe. The fantasy of studying in France is intoxicating, which is why Leni Morales was ecstatic when she found out she got a scholarship to be a part of the Erasmus Mundus Program. When did you first hear about the Erasmus Mundus Program? I heard about the EMMA-West (Erasmus Mundus Mobility with Asia-West) when I was in my third year of college, pursuing a BA in European Languages Major in French, and a minor in Speech Communication at the University of the Philippines in 2011. How much was the application? 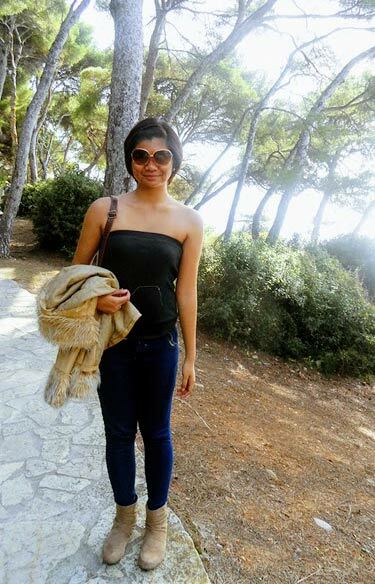 In 2012, I received an offer to study French for a semester at the University of Nice Sophia-Antipolis. For the first month, I lived in a private student dorm, where I shared a room with a phD student from Pakistan. Later on, they transferred me to a university dorm, at the western area of Nice. Rent was cheaper there. I had a small room to myself [that was fully furnished.] The kitchen and toilet were shared facilities for students on the same floor. During the six months, I studied and improved my French. In my free time, I traveled around my host city and eventually, around France. I also got the opportunity to travel to other countries such as Belgium, Italy, and Greece. What kind of adjustments did you have to make? I arrived in the summer. The sun rose at five o’clock in the morning and set around ten o’clock in the evening. It was very difficult to sleep or to have dinner because my body was not accustomed to eating dinner while the sun was still up. During winter, when days are shorter and night falls as early as four in the afternoon, it was just as hard. Apart from that, I needed time to understand and evaluate what was expensive and what was not. Initially, I could not stop converting from Euro to Philippine Peso. It also took some time to adjust to how they did things in school. It was different from what I was used to. In the Philippines, we actively participated in class. In a French classroom, or at least in my university, we would listen to our professor most of the time and the few classroom activities we had were rarely graded. I remember only having to either submit a paper or answer two questions during a written exam—my entire grade would be based on that. Attendance was not even required. I was surprised to see classmates of mine during exam week whom I never once saw attend class. What were the living conditions and the studying conditions like? It is really cheap to study in France, although the cost of living in France is quite high. Students benefit from discounts because services that we would pay for in the Philippines are subsidized by the French government or school. Apart from university libraries, we could also freely access city libraries. Libraries and classrooms are well equipped with computers, speakers, projectors, and more. How did you cope with learning a foreign language? Since I came to study the French language, it was imperative that I improve on it. I came with an advanced level in French but it was apparently not enough. During the first few months, I could not utter a word in French. I wasn’t confident enough to speak. I was afraid of making grammatical errors. But people were patient enough to repeat or rephrase their sentences/questions. Little by little, I gained confidence and was able to comfortably speak better and spontaneously. Did you experience homesickness at all? There were days when I would just cry out of nowhere, without knowing why. I remember a day when I was slicing hotdogs for the spaghetti I was preparing, then I suddenly burst into tears. What were the lessons you learned from your experience? The most remarkable lesson was that I should be proud of my roots. I became more appreciative of the uniqueness of the Filipino culture; while trying to integrate myself into the local French culture, [I made sure I didn’t forget] the habits I grew up with. Also, a friendly, sincere smile goes a long way. You are once again an Erasmus scholar—how did you hear of the scholarship this time around? I was searching for similar opportunities so I could pursue my Master’s degree in Europe, but not necessarily in France. I was still in touch with my program coordinators both in France and in the Philippines. They informed me of various offers and that was when I heard of the program I applied for in 2015. Since I was applying for an MA, the application process was a little harder because I had to write most of my letters in French. 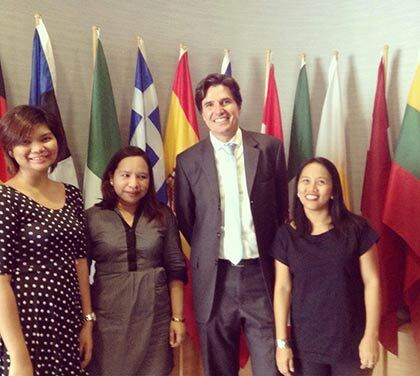 The language certification cost me about P5,000. On top of that, I had to ask for another set of my transcript of records and all sorts of university documents—those cost around P2,000. I’m finishing my MA Sciences du Langage, Diffusion du Français at the Université de Rouen. My Erasmus scholarship under IMPAKT Project (impakt-asia.eu) was good for ten months. In order for me to obtain my MA, I had to look for another scholarship that would finance my second year. The CampusFrance (PhilFrance Scholarship) supplemented my second year. What kind of adjustments did you have to make this time? This time around, I’m more familiar with the system. My struggle is language-related and again, getting used to the French education system. I developed my level of French over time. Sometimes, French people would mistake me for a French native. They would often be confused as to why I don’t know some things or why I don’t understand how things work. Despite the fact that I succeeded in my courses, I often get comments about how my output isn’t “French enough”—which is normal because I am not French and even if I speak the language, I speak two other languages that influence my train of thought. Did you work while studying? A friend of mine referred me to her employer; she teaches French adults how to speak English. It’s in a language school located in the city center. I made 20 Euro per hour. I taught for four months and decided to stop because I had to focus on my internship the following semester. I will go back to teaching at UP. What are your tips for those who want to have the same journey and experiences as you? The journey won’t always be easy but every single moment will be worth it. Don’t forget: You’re never alone. If you begin to doubt yourself, remember that there are people who support and believe in you. Interested in learning more about the Erasmus+? Visit their website for more information.